The lack of resources made them creative. From Montería, Córdoba; comes a project led by the teacher and painter Idelfonso Mestra; it is an initiative that seeks the development of works of art with the starch of cassava that is usually discarded, to reuse this waste that is polluting and provide the possibility for students to work with low cost materials due to economic limitations. Casabe al arte received recognition for the best social entrepreneurship initiative of the RECON competition in the category of artistic, cultural and sports practices. In a land where violence has been leading for years, hope is low and poverty high, an invisible hero has transformed an entire context. He has positively influenced the lives of many young people and has taught them to work with creativity. 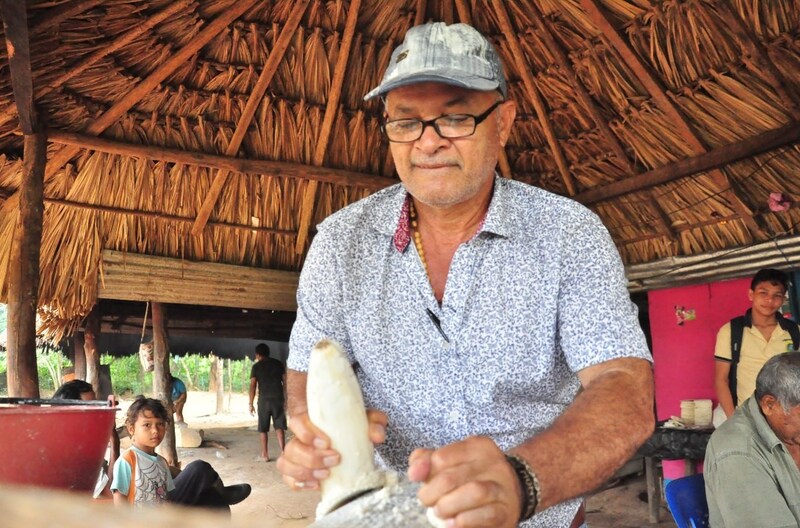 Idelfonso Adán Mestra Madera has a degree in philosophy, a theology, specialty in teaching, he is teacher of the educational institution San Isidro in the area of religion and art, and has held his post for meritocracy for 10 years. When the area of art was assigned, the students of this institution had 17 years of not being instructed in this area, leaving a gap in the creative part of the students. In addition, art is as essential in communication as knowing how to read and write. He started a research project to take materials from the area that serve as a basis for art, replacing the vinyls, watercolors, temperas and oils. It is also worth mentioning that at the beginning the students did the paintings with their hands and that is why they were given the task of developing their own tools. This project benefits 350 students from the rural area of the municipality of Montería – Córdoba. It is important to note that in addition to being a rural context, it is very poor and violent. The majority of the students have a destroyed family nucleus, live with grandmothers, aunts, godmothers, mothers heads of families or only with their dad, and this originates emotional imbalances in the students causing low academic performance and little interest in school. One of the great benefits of the project is that it works as a catharsis so that students have an emotional balance; another aspect is that it serves as resilience in overcoming difficulties and having projects of lives, dreams and interest in school. The son of peasants from Córdoba, displaced by violence, this has led him to have great solidarity with his student. He works from Monday to Saturday and every hour he dedicates to his students makes him feel that being a teacher is worthwhile. Many of the young people have gone through many situations which are similar, so being immersed in the context of a rural school and having this life project is an incentive to support the construction of dreams and illusion. The taste for art is a tool to train better human beings, to contribute to social equality in children and young farmers. In Colombia we are living a post-conflict process and art is necessary to heal the 50 years of war that the country has lived. Art heals wounds and contributes in the process of reconstruction of human networks. Ildefonso seeks to be a reference of resourcefulness, to create art with context materials. He expects the wider dissemination of this initiative for others to benefit from it. This is the video with which he participated in the contest.